Enter the Horizon Organic Ultimate Adventure Sweepstakes now through October 31, 2018 at Horizon.com/DisneyPixarIncredibles for your chance to win a $10,000 ultimate adventure prize in the form of a check which you can use for plan your own ultimate vacation, Incredibles 2 Prize Pack plus daily prizes. Visit this link:Horizon.com/DisneyPixarIncredibles to go to the sweepstakes page. Prizes You Could Win: A $10,000 ultimate adventure awarded in the form of a check for winner to plan their own ultimate vacation (“Grand Prize”). First Prize (200): An Incredibles 2 Prize Pack including one (1) backpack, one (1) school kit set, one (1) bouncy ball, one (1) 3-pack of plastic folders, one (1) sticker sheet; and a Horizon Prize Pack including one (1) lunchbox, one (1) pencil, and one (1) pencil bag (“First Prize”). ARV of First Prize: $75 each. Daily Prize (164 – 1/per Daily Entry Period): A Fandango Promo Code good toward four (4) movie tickets to see Incredibles 2 or any Disney movie at Fandango partner theaters in the U.S. Fandango Promo Code expires on 12/31/18. ARV of Daily Prize: $60 each. Total ARV of all prizes is: $34,840. 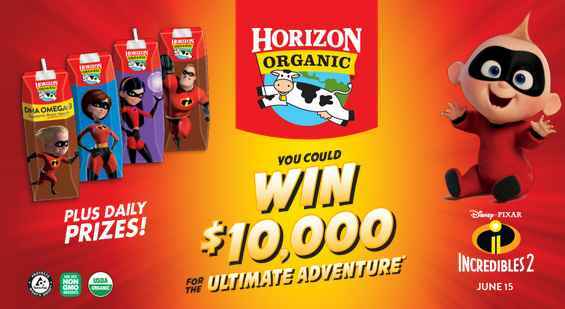 When To Enter: The Horizon Organic $10,000 Ultimate Adventure Sweepstakes will begin on May 21, 2018 and ends on October 31, 2018 at 5:00 pm ET. Sponsor: The Sponsor of the Sweepstakes is WWF Operating Company, LLC, 12002 Airport Way, Broomfield, CO 80021.